Of the thousand pounds of potatoes we grew last summer only two crates remain. Some went to the monastery on the grounds of which we have our biggest garden, our acres being so largely vertical. The monastery doesn’t store potatoes but uses them when they are first harvested, thin-skinned and sweet. Our household eats potatoes twice a day, year in, year out; fried with onions and ham at breakfast, other ways at dinner. About one hundred and fifty pounds of potatoes are set aside at harvest and stored at the back of the root cellar; these are the seed potatoes of the next year. There are two schools of thought here about seed potatoes. One school holds that you should save the best potatoes for seed because they have the best genetics and should be propagated. There is much sound reasoning in this argument and it is the standard line of thought in seed saving. However our experience, limited maybe but our own, has been that small whole potatoes when used as seed are less likely to rot in the ground than cut potatoes, whether these have been cured before planting or not. Under perfect conditions potatoes sprout right up, and in this case seem to do fine, but should the weather turn wet or cold just after potato planting there is a good chance your cut potatoes will rot where they are planted. Whole potatoes, on the other hand, have pretty good holding power, as you may see by the volunteer potatoes that come up in your last year’s potato patch. To be on the safe side, we plant both kinds. Our root cellar is rather more humid than the ideal, but the potatoes do very well there, and we see very little rot, almost none in fact. Pontiacs, round, red, thin-skinned potatoes, bear profusely, and we get more of these; but the Yukon Golds store longer, and we save them to eat when the Pontiacs are gone. Somehow, though, a crate of Pontiacs was overlooked and we are eating them now before the new potatoes begin. These last potatoes have sprouted twice – and twice had the sprouts rubbed off — and are withered but sound. A visitor to the farm was surprised to learn that in this condition they are still edible; Americans don’t like to eat things that don’t look new from the factory, even when we know better. Actually you won’t know the difference when they are cooked, unless maybe they are a little gummy when mashed. It is curious; crated potatoes sprouting will sometimes send a root right through a neighboring potato with no harm to it. You can eat it just the same after you cut the root out. Two little girls with switches are driving the cows back down the lane to the barnyard. The wind has picked up and the temperature is dropping. Chickens, with whatever sense God gives a chicken, seem to know something is coming, for suddenly they are being drawn as though on threads from every corner of the pasture and hillside, back to the safety of the hen house. The rain for which we have been praying for the last week may be about to fall. Someone runs out back to pull the laundry off the line. Rain now would be especially good as we have just finished putting in the potatoes and the onion sets. One hundred twenty pounds of seed potatoes, and six pounds of sets, in about a thousand square feet of garden; in a good year that will yield a ton of potatoes, and enough onions even for our onion-loving family, plus what the monastery will use. We can only plant those vegetables here which the local deer don’t usually bother; this garden is not patrolled by dogs or people as the home gardens are. Half the ground has been in cultivation for two years already; the other half was turned over from sod last fall with a two-bottom plow behind a tractor. All of it was turned again about three weeks ago, and rototilled at least once before being planted. So much mechanical cultivation is not our normal protocol, but this hilltop has not been gardened for years, and the sod is persistent. The garden is too large for the weeds to be controlled by mulch alone, so for the first few years we will use plow and tiller to bring the soil into cultivation. Our experience in other gardens tells us that eventually the soil will become more open and fertile and we will be able to work it primarily with our hand tools. In the large garden below the house, for example, the tiller was used to incorporate compost into the top layer of soil, then with rakes and hoes we made the thirty-inch beds which are being planted now to spring onions. The peas are up, as is the lettuce, also the spinach, beets, and carrots. The onions and garlic in the big garden are big enough to withstand the depredations of the occasional chicken who finds a hole in the woven wire meant to keep them out. Chickens are the very dickens to a garden. The potatoes, in the big potato patch up at the TOR’s, are not yet up, and with the prolonged damp, they may rot before they can get leaves above ground, forcing us to replant; but we hope not. It has happened before, but that spring was not only wet, it was cold — okay, it has been cold on and off this spring, too — and that other spring we skipped the important step of curing the seed potatoes after we had cut them. Wiser now, we did not this year omit giving the starts a two- or three- day drying on the front porch table, so we pin our hopes on that and pray that our potatoes are doing well down there where we can’t see them. Webs of rusty wire are laid over most of the raised beds in the gardens by the house. This means they have been planted: they are nurseries now, and the depredations of dog, cat, or chicken are not welcome here. Over the last two weeks, as the temperature would allow the soil to be worked, these beds, manured last fall, have been turned, raked, and sown. To cover crops, mostly: rye, vetch, and clover. Always providing the seeds germinate, some will, in time, be forked under, adding vegetable matter to beds meant for other crops; other covers are semi-permanent, low-growing enough to remain when the food crop is set out, to shade the soil, repress weeds, and bring up nutrients from below the topsoil. These, when they are eventually mowed or tilled, will amend the soil for the plantings of future years. Rye and vetch have been sown together where the earth would otherwise grow weeds until beans go in at the end of May; dutch white clover will provide a living mulch for a bed of tomatoes. Protected from these is a long row of lettuce, spinach, carrots, beets. Nothing is germinating yet. Patience. In the house there is germination, pots of tomato, pepper, brassica, herbs; some flowers. They will be moved to the green house one by one, as the seeds in them germinate; warm enough for growing them, the greenhouse, in this still-chilly weather, is too cool to germinate most of the seeds we start indoors. Broccoli and tomato are already out there; now we must be diligent to remember to close the greenhouse at night, open it again by day. The hoop house, planted to lettuce too late in the fall for anything to mature over the winter, will pay dividends now with early lettuce, hardy after a winter of dormancy. It is supposed to go up to ninety degrees today, and it is easy to believe it. We are sweating in the shade, and the fan in the living room feels really good. As the rains have slacked, we have been catching up with a lot of chores which couldn’t be done in the mud. After the boys demolished the old chicken house a week ago Friday, building the new one became a priority. The old chicken house was a pole structure with a brick floor, but because of the slope of the land behind it, it has long been a mudhole, and adding litter just increased the amount of time it took to dry out when the rains stopped. The new chicken house, designed in the main by S-2, is a frame building with a raised floor, eight by twelve, on locust posts. They erected the floor on Monday despite frequent showers, and by Monday night, the north and south walls were framed and held up by diagonals. By Wednesday, still in the wet, the sheet metal roof, recycled from the old building, was up, and the siding began going on. 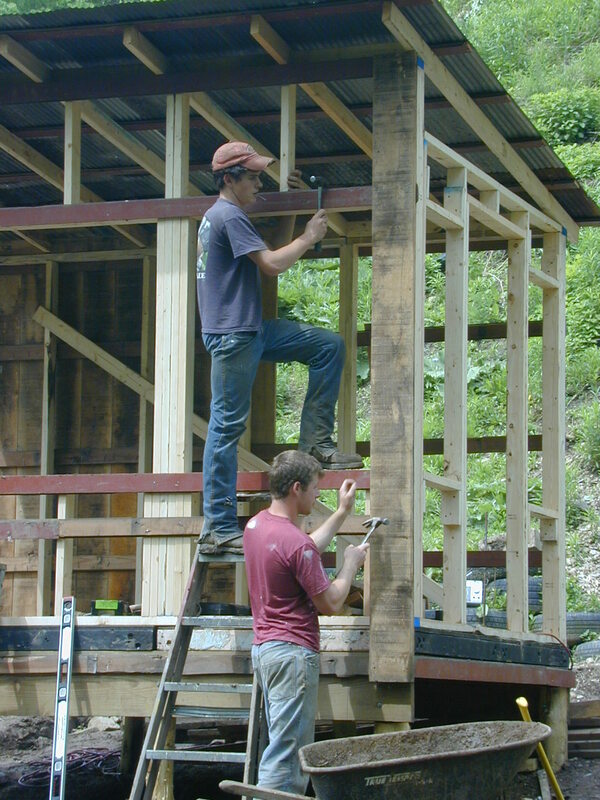 The new siding is to be board and batten, of an unfinished lumber available from a local mill, which sells for thirty-five cents the board foot poplar, forty cents oak. We purchased one by six poplar, and will rip the battens, which probably will go on about four days after the first snow makes them indispensable. Right now the cracks between the boards are just good air circulation, something the new chicken house has in abundance, having large windows on three sides. The north side, which faces uphill anyway, and would not admit as much light as the other sides, is without windows. The windows are covered with one-inch hardware cloth, and will be sealed for the winter with plastic sheeting about the same time the battens go on. Thursday night the finish work was mostly complete. The interior of our new chicken palace is divided into two rooms, one eight by eight, furnished with roosts for forty which can be folded up against the wall when it is time to change the litter. The dividing wall between this space and the four by eight feed room is just studs and chicken wire, with the nesting boxes hung in the smaller room, and only their openings on the chicken side of the wall. The backs are hinged and the whole arrangement is low enough that little people can easily open them and collect the eggs. A hopper in the dividing wall drops feed into the trough where the chickens get their grain; their mash or slops are fed outside, to keep the chicken house as dry as may be. Grain is stored in metal trash cans. On the south wall of the feed room will be built four small nesting boxes for the confinement of broody hens; the hatching of chicks for meat and the replenishment of our flock is a key factor in our revised poultry management. We hope our new Speckled Sussex hens, now in their adolescence, will live up to their reputation as good mamas. So much for the chicken house. While this project was making, other timely chores were underway as well. Necessarily ignoring the intermittent thunderstorms which alternated with grey overcast and occasionally bright sunshine, we had to be getting in the gardens, and tending the things already growing. Shawn spent two days tilling the potato patch in order to suppress weeds between the rows, and hilling the potatoes to increase yield. The generous rains meant that some of the seed potatoes rotted in the ground, leaving spotty rows in the potato garden. This seems mostly confined to the section of the garden planted to cut seed; the areas which were planted with small whole seed potatoes are very consistently sprouted. This may also, however, be in part the consequence of variations in planting depth; some of the garden was planted by hand, the holes being dug by Shawn with a shovel, and other areas – the ones S-3 planted to whole seed – were laid out in trenches plowed by the BCS cultivator, so that the depth was consistent and not too great. Next week, while the haying is going on, the girls and I will go over with a shovel and some small sprouted potatoes and try to fill in the gaps, because our future pig policy demands a great many potatoes. Last year we harvested about two thousand pounds of potatoes, and that was merely sufficient for our own use, those the sisters’ used while they were still new, and this years’ seed. We will have to do some reading to determine how many pounds of potatoes would be necessary to make a significant supplement to our pigs’ diet. Four pounds of cooked white potatoes is supposed to be roughly eqivalent to one pound of grain, but if we factor into that the protein content of a gallon of milk per pig per day, fewer potatoes should be necessary. I begin to feel overwhelmed. We have been feasting on enormous salads of buttercrunch lettuce as we hurry to use all the early heads before they bolt. The heads that begin to grow tall will be carried down as a treat for the chickens. The spring sown lettuce is more than ready for thinning, and will soon head out; the mesclun will add color and texture to the young buttercrunch thinnings. The peas are now about four feet tall, and we found the first blossoms on Friday. A salad of mixed greens with snow peas and chive flowers is a spring celebration. The beets and carrots planted in early April are still rather small, and not so crowded as to need thinning; we hope they will mature fast enough to be ready for eating before the zinnias we are setting out along that row grow tall enough to shade them out. Another planting of carrots was made last week in a row sown in April to spinach which saw a poor germination rate. Another sowing of spinach will have perhaps a fifty-fifty chance of maturing before the heat makes it bolt. Every year sees some things which make, and some which fail, which is probably good for us in some way too complicated for calculation. Perhaps if the asparagus bore well every year we would tire of it, or it would cease to provide the tonic effect we look to find in our first fresh green food of the spring. Maybe. Those years that the apples do poorly, the pumpkins are liable to be generous, so we have our pies anyway. When blight ruins the potato crop, the corn may do exceptionally well, but I can’t really remember. Things do seem to balance out, anyway, except in Elijah years, and may we never see one. The bees are ongoing education for us. Somehow we only seem to make sense of what we read in the light of things we realize we have overlooked. 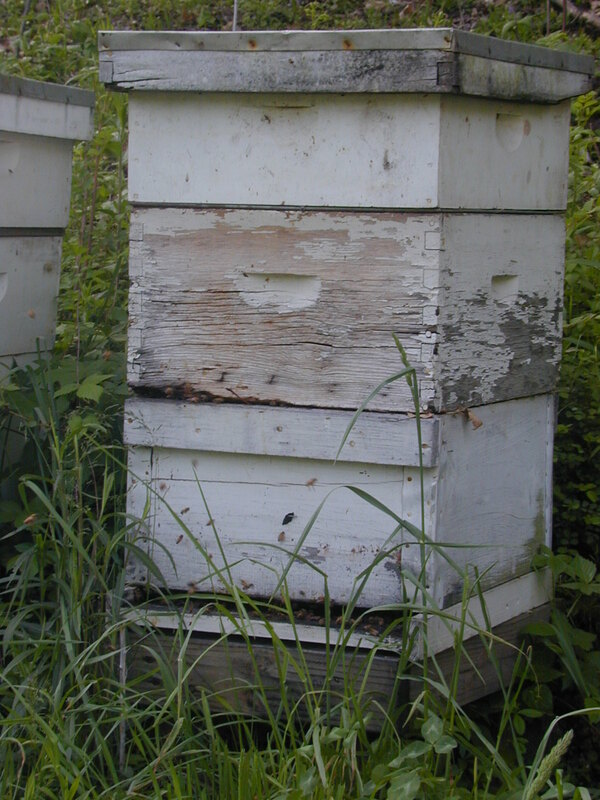 A week after we find ten queen cells in a hive, and hasten to make a split with the hope of averting a swarm, we find in our bee books better methods, or advice conflicting with the idea of splitting colonies for swarm prevention. Yesterday we broke into both halves of the split, to find capped brood, but no young larvae, in either hive body. We guess, but without any confidence in our guessing, that our old queen has departed with a swarm, and we hope, without confidence in our hope, that the queens which have now hatched, will requeen the hive, the two halves of which we will probably reunite for strength. By our calculations, the queens will have begun hatching or pupation or whatever it is called within the last four days or so, and require in the neighborhood of eight to eleven days after pupation before they begin to lay. Bee eggs are visible to the naked eye, but not so easy for the inexperienced to spot; two or three day old larvae should be visible even to our eyes within two weeks of requeening. That means if we don’t see eggs or larvae in those hive bodies by Monday week, we will be in a hurry to order a new queen. We really hope that isn’t necessary, not so much to save the twenty bucks as because a colony without a queen will sometimes have a worker bee which gets notions and begins to lay, and while she is with them, the colony will be unreceptive to a replacement queen. Or so we have read. These issues create tension for the baby farmer. Always lurking in our unconscious mind is the question whether those of us not born to the manner have any business to change vocations in our adult lives. Any failure or shadow of failure causes the infant farmer to wonder whether we have aspired to things by nature above us; whether we are attempting to insinuate ourselves into a segment of the human population in which we are not wanted and for which we have no talent or education, where we will stand out for our ineptitude like a turkey in a flock of geese. Uncertainty as to the outcome of a project is much sharper when the results of failure will be expensive in terms of cash or of livestock. We don’t like things to die unexpectedly, and for those of us for whom the family farm means an investment not of surplus income, but of the cash required for our needs, the looming failure of some expensive project or piece of equipment causes much stomach churning. Experience has taught us that this is just a part of retooling modern man to survive without Walmart, but knowing this is so does not defuse the tension. S-2, having departed at one o’clock to begin cutting the hay, called at one-twentyfive to report the sickle bar mower, reconditioned over the winter by S-3, broken. No details. The men are gone with tools and truck to investigate. A classic creator of tension. All the haying time is like that, and until the cutting is baled and in the barn, we will be living on the verge of hypertension and stomach ulcers. I am going up there in a minute in case they need someone to run errands, or to swear at. Be it noted here that those seed potatoes planted whole, while planted later than the cut potatoes, are sprouting in a much more consistent pattern than have the cut ones. Just thought we’d mention it. Whether, being small themselves, they will produce smaller potatoes than the larger cut seed potatoes, we will only know later in the summer, and we will try to remember to record that information here.